Top 10 Coolest Strollers for Multiple Babies! Got lots and lots of kids? Need a super stroller to take all of them out? You got it! Whether you have six kids, five, four or triplets, you are here today because you want to find a cool, sturdy and reliable stroller for multiples! 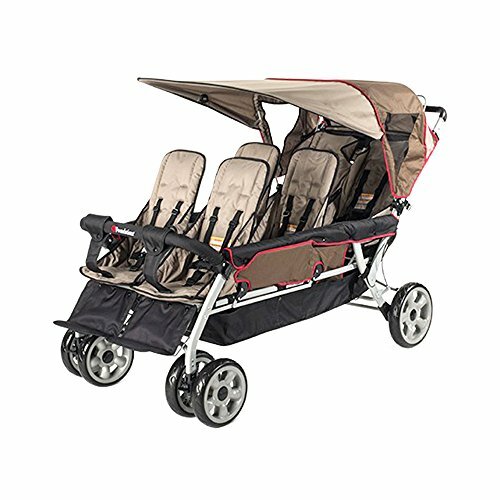 Just imagine being able to put all of them together in ONE amazing stroller and head outdoors for a fun outing! That would be a dream come true right? 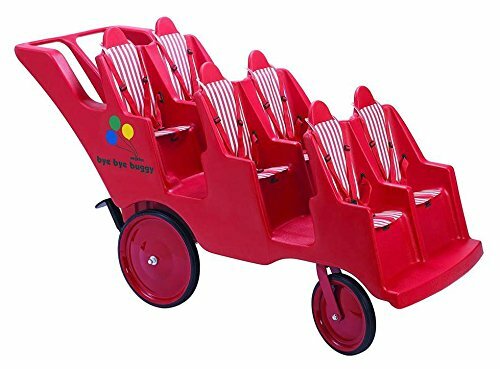 When I saw these fabulous strollers for multiple children just like this one you see on this picture, for SIX babies, I went crazy! They are not cheap, but they are a life-saver! With one of those you will finally be able to take your children with you outside by yourself if you want! When you invest in a high-quality stroller, you are making sure your babies will be comfortable and safe while you are also able to go for a walk stress free! 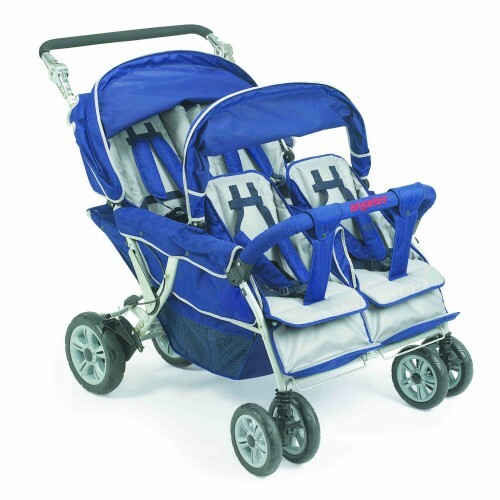 6-passenger strollers are obviously perfect for parents with sextuplets or quintuplets! They will allow you to go out taking all your children in one place! It is easy to push and so much fun for the kids! As you can see they all travel in a nice upright position, allowing them to see everything around them! It will fit kids up to 40 lbs each! If you are looking for an affordable stroller that fits 6 children at once, you are going to love this one! This stroller is also very comfortable for them and it will fold! 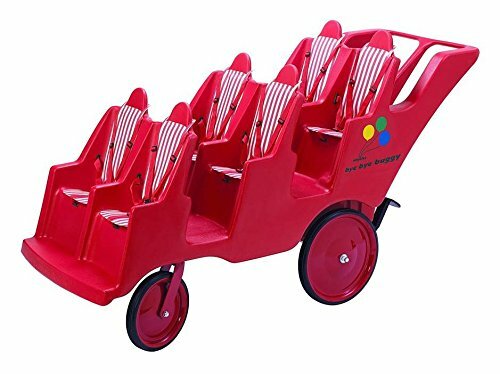 The Most Fun Six-Passenger Stroller! 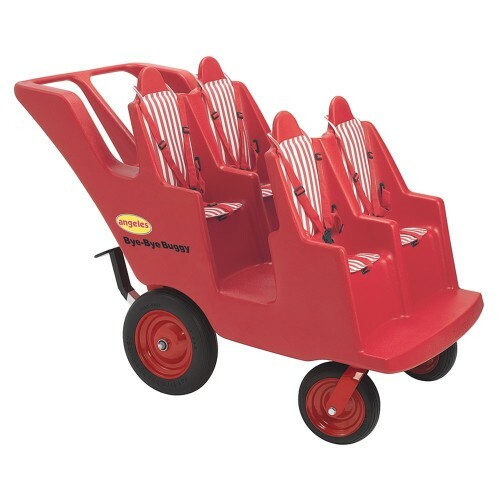 This is the most fun and ultra-cool ‘child buggy’ stroller for six passengers around! Very comfortable for the little ones and very easy for moms to push! 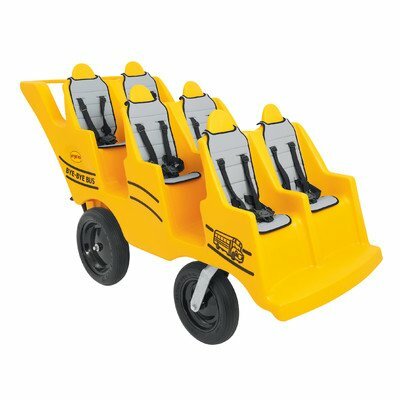 It also fits through most doorways and the kids have a blast while riding in an upright position! If you are looking for the best strollers for quads out there, then you are going to go crazy with this awesome and colorful 4-passenger baby stroller! Their seating space and position was designed in a way that all of them can see everything around them! There’s also a handy built-in storage space and it is perfect for toddlers! 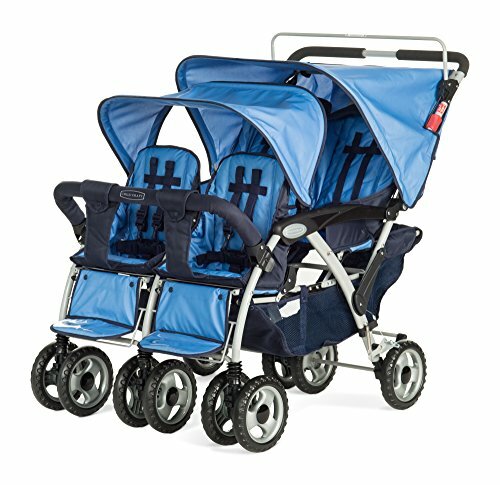 Another awesome stroller for quadruplets! It almost looks like a fun ride from a Disney park or something right? Moms love the nice canopy too! Everyone will have fun going out! This is probably one of the most affordable strollers for quads out there! It has a cool blue color and it is made of a very easy to clean fabric. It is comfy for the kids and easy to clean. It also comes with the canopy and large storage baskets! Overall it is a pretty cool multiple stroller for the price! 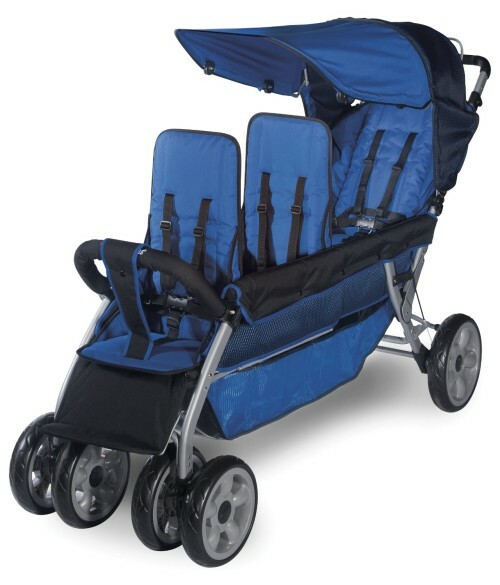 Another great affordable folding blue stroller for quadruplets! The quality is amazing and it rides very smooth! Parents are really happy with this awesome stroller! It is also nice and easy to maneuver and not so heavy to push! Fits babies and toddlers as well! Then you need an awesome stroller for 3! This is a comfy and very nice 3-passenger-stroller for sale! The seating area is very large and offers a nice view for the kids! 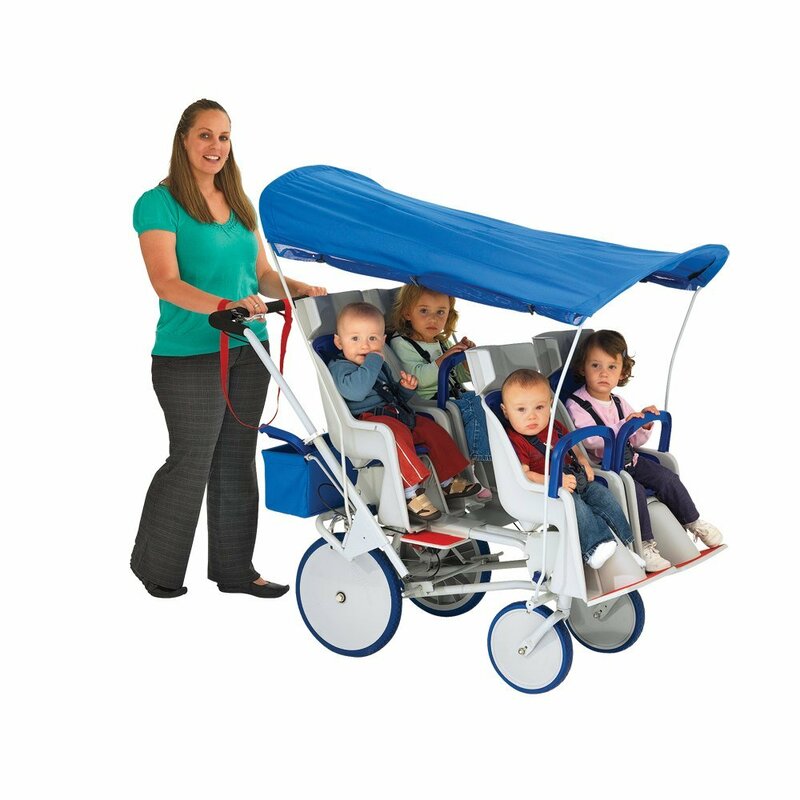 parents love the fact that this triple stroller also folds easily and it fits through most doorways! The nice canopy will keep your little ones safe from the sun while they enjoy being outdoors! The nice storage basket is also a huge plus for moms! 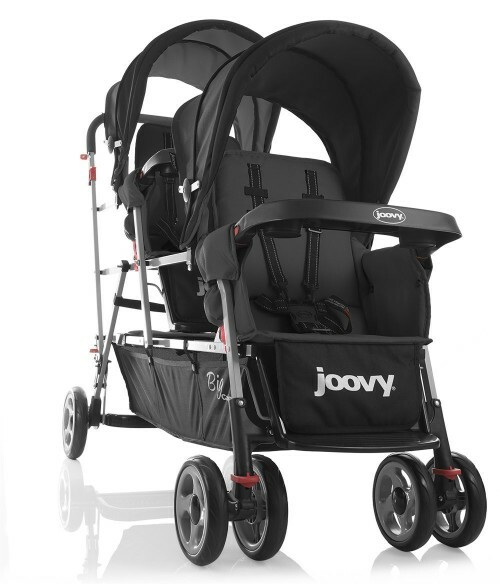 This gorgeous Joovy triple stroller is absolutely perfect for parents with twins and a toddler! The front seats fit babies and toddlers up to 40 lbs and the rear seat fits an older child, up to 45 lbs! It also has a huge storage compartment and the nice canopies! Great for taking your kids to the zoo or the park! Besides this beautiful all black color, you can also get it in black and apple green! If you have time, check these out too!